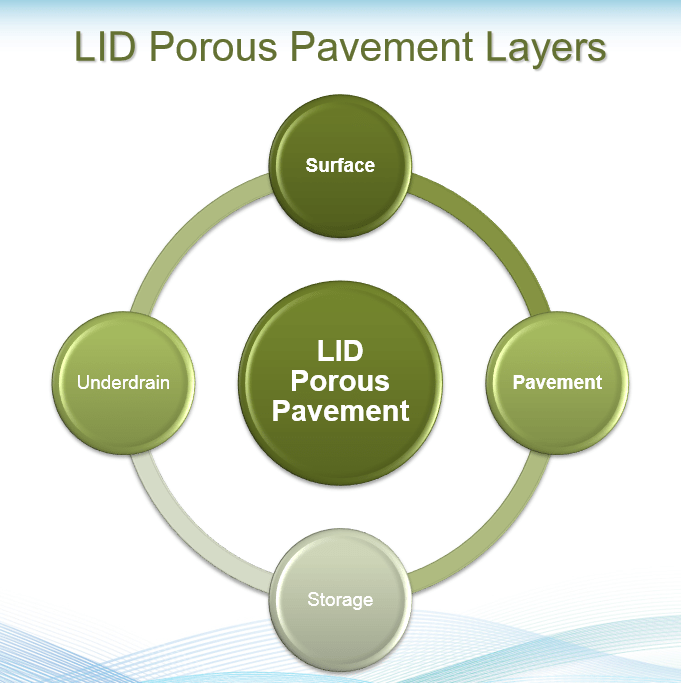 The Porous Pavement LID Control has five components or Process Layers: Surface, Pavement, Storage and Underdrain. An example of a Porous Pavement Driveway. The four layers used in a simulation for a Permeable Pavement LID are shown in the following image. If one has an estimate of the number of years it takes to fully clog the system (Yclog), the Clogging Factor can be computed as: Yclog * Pa * CR * (1 + VR) * (1 – ISF) / (T * VR) where Pa is the annual rainfall amount over the site, CR is the pavement’s capture ratio (area that contributes runoff to the pavement divided by area of the pavement itself), VR is the system’s Void Ratio, ISF is the Impervious Surface Fraction, and T is the pavement layer Thickness. As an example, suppose it takes 5 years to clog a continuous porous pavement system that serves an area where the annual rainfall is 36 inches/year. If the pavement is 6 inches thick, has a void ratio of 0.2 and captures runoff only from its own surface, then the Clogging Factor is 5 x 36 x (1 + 0.2) / 6 / 0.2 = 180.